If you’re tired of searching for the flashlight every time you need to get into the back of your closet, stairwell, bathroom, etc.,... You need the Instant Touch Light! Instant light, wherever you need it, whenever you want it. 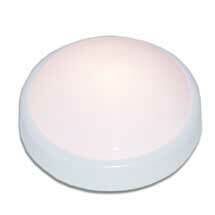 Safer than candles, simply tap on the dome to illuminate, and tap again to turn it off. Ideal for children’s rooms, bathrooms, closets, hallways and stairways, walkways, basements and garages. Great for use on boats and in RVs too!